Mormon Mommy Writers and Friends: The Gift of "No"
I’ve been up for a major promotion at work. I’m talking several dollars an hour more, way more responsibility, with the ability (and expectation) to direct the efforts of several people. When I applied, I saw it mostly as an opportunity to make changes and bring the people around me into alignment with the vision of my department (and with my own work ethic). There were downsides, for sure. I’d already had a career where I was responsible for a shift of people, and I knew it was significantly more stressful than just being accountable for my own work. The schedule was going to be worse for my family, but the pay would also lessen the strain on us. I knew that I was very well-qualified (10 years supervising a 9-1-1/dispatch center pretty much covers all the bases for supervision qualifications), but there were several people up for the job, all well-qualified. Short story is, I didn’t get the promotion. But, in subsequent conversations, I received an opportunity to do more of the things I enjoyed about supervising. When I worked in the police department, I helped with training, both new employee and continuing education. It was one of my passions there, and something I mentioned at length in my interview at my new company. I was given an opportunity to use those ideas and talents even as I was denied the big giant promotion. The more I think about it, the happier I am. It’s not the huge raise, but it’s also not the major jump on the stress-scale. How many times do we receive this same blessing in life? We want, and feel we deserve, this big thing—whatever the big thing is. It’s different for everyone. It could be a job, a marriage, an opportunity of some sort, a friendship, whatever the “thing” is. And then, we’re blessed with the “no” answer, only to find that there is something else. There’s that picture of the Savior holding a giant teddy bear behind his back, in front of a little girl who has a smaller bear. 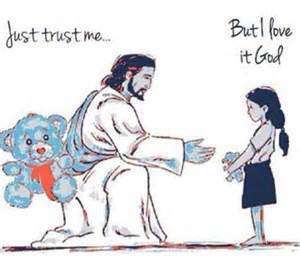 She doesn’t want to give her bear up, because she doesn’t know that the bear Jesus is holding is so much bigger. I’d like to challenge that a little. Sometimes, the bear is smaller. I'd love to credit this, but there are so, so many copies of it out there that I couldn't find an original attributed to anyone. If anyone knows where I can find the owner to attribute, let me know!! Sometimes it’s not even a bear. Sometimes it’s a box of other, smaller things, things that have no relation to the bear. Sometimes, it can be more like an IOU. We have to miss our little bear that we love, and have faith that the sacrifice of this thing we loved and treasured, or wanted and worked for, is going to be worth it. The question becomes, do you believe in Jesus Christ. Do you believe what he says? When he tells you that He loves you, and wants only the best for you, do you believe Him? Do you believe that God is all-knowing? Do you believe that HE loves you? If you do, then even while you mourn the loss of the “thing” you wanted, and you deserved, but that wasn’t for you, then you can look forward with faith that it will be made up for. Sometimes, when you’re told “no,” you are instead offered something better right away. Sometimes you get something different—I get to use my talents in a way that I’d not really thought I ever would be able to use them again. Sometimes you are left with a hole, a wanting—there are mothers aching to hold children, men and women without wives or husbands, people without homes—there are as many yearnings as there are people in this world. This time, I got something “less” that ultimately feels like “better”—but I have things I yearn for and will probably never receive, just like anyone. I have holes where I feel losses so deep sometimes it’s all I can do to not curl up on the floor and sob for days. But, at the end of the day, I know that all things will—WILL—be made right. Not the “right” that I think is right with my myopic mortal vision, but truly right. I know this, because I know that God loves me. I know that Jesus loves me. And I know that they’ve promised me that I will have everything they have. That all things will be for my good, if I will trust Them and follow Him. And sometimes, the reminder of that, THAT is the gift that “No” brings to me. The chorus to one of my favorite songs says, "All I've ever wanted, all I've ever dreamed of, everything I hoped, and all the things I prayed for couldn't hold a candle to what I've been given- I've been given what I need." We have to trust!